(MENAFN - UkrinForm) On April 15, Russian occupation forces launched 12 attacks, using weapons banned under the Minsk agreements four times, on Ukrainian troops in the Joint Forces Operation (JFO) area in Donbas. 'Russian occupation troops fired 120mm and 82mm mortars into Ukrainian defenders. In addition, the enemy fired grenade launchers of different systems, heavy machine guns and small arms, the JFO Headquarters press center reports. 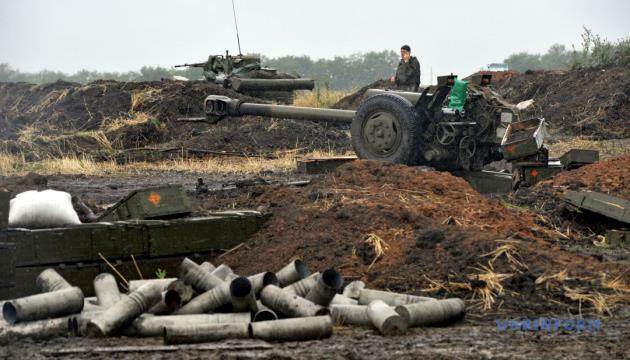 In the zone of action of tactical force 'East, the Russian-led forces used 82mm and 120mm mortars, anti-tank grenade launchers and small arms to shell Ukrainian troops near Avdiivka (17km north of Donetsk); 120mm mortars outside Novoselivka Druha (36km north-east of Mariupol); 82mm mortars, grenade launchers, heavy machine guns and small arms nearLebedynske(16km east of Mariupol);grenade launchers of different systems and small arms outside Opytne (12km north-west of Donetsk); hand-held anti-tank grenade launchers, heavy machine guns and small arms in the area ofVodiane(94km south of Donetsk);heavy machine guns outside Nevelske(18km north-west of Donetsk). In the zone of action of tactical force 'North, the enemy used small arms to shell the Joint Forces units near Stanytsia Luhanska (16km north-east of Luhansk).